Day 8. We will leave the region of the river Ulla, with its steps immortalized by Countess Pardo Bazán. Crossing the River by the Furelos bridge will reach Melide. 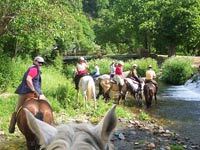 We will visit before Pambre Castle, a medieval fortress that is named after the river that bathes its foundation, with numerous typical mills and manors. In the afternoon will pass by Castañeda, seat lime kilns for the construction of the Cathedral of Santiago, some pilgrims carried a stone in his backpack increasing their penance. Who dares to emulate those pilgrims should be dismounted, because the never heard about a penitent horse. Dinner and overnight at Arzua. Day 9. From Arzúa, center of a region of delicious cheeses, depart to Labacolla. Where we will eat and finish the route. There the Pilgrims whom had left forces, ascended to the Monxoi (Monte del Gozo) to be the first to see the cathedral. Riders make the last stretch on foot and all should give thanks to the Apostle for happily conclude the pilgrimage. 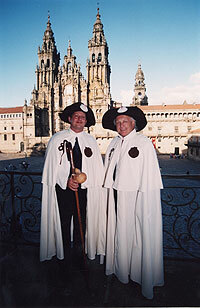 From then, free time for riders, they can go walking or in our support vehicle to Obradoiro Square in the Cathedral of Santiago Compostela and get the Compostelana.